So my wife and I have this crazy idea where we can teach the concepts of fiber glass and composite construction in a fun and non-toxic way: Foam Core Derby. 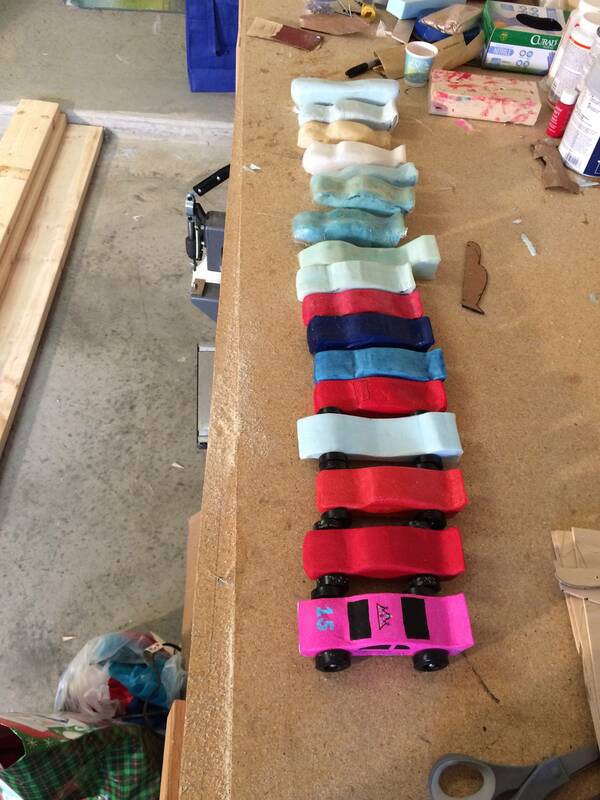 We are going to have folks make pinewood derby sized cars using fiberglass and a non-toxic glue. Think of it as Paint Nite except you get to compete with each other at the end of the evening. We want to host it at bars and restaurants during slower periods (i.e...non game-day evenings or weekend mid-day). Would any of you take part in this? What would you pay for it? If you're in the DC area and want to be part of the initial focus groups, PM me. Get the Boy Scouts involved. They have an aviation merit badge and a car-based pinewood derby already. Don't you think kids would be a better target audience? The problem is your non-toxic 'glue', which comes with two problems, one minor and one major. The minor problem is that it won't break down the binders in fiberglass mat, requiring you to use a much more expensive woven product. The major problem is that without toxic chemicals it can only cure through oxidation or moisture-curing, drying. Not going to happen in the space of an evening, even with a very thin laminate part. He has already done this. I've seen the result. It works. Oh, and Tara and I are in. That's where this started. I wanted to rent a track from the local council as a way to donate, but they didn't have one. Part of the plan is that 10% of the revenues go back to youth charities. Also, we're thinking that 1 in 20 events be done for a youth group. We think ideal age is 10+. One problem I have is that I want to be a Big Brother, but I move every year or two. We're cool with kids. I did have one advisor (a B-school professor) express his frustration that there weren't any father-son activities easily accessible other than sports games. Those are expensive. It may still all not work. We're not sure if there's big enough demand. The successes of Paint Nite and the escape rooms tell us that urban millenials are looking for social activities (turns out that the Twitter doesn't give much social interaction), but that's really just a theory. The track is still a problem. A couple of guys and a pick-up can move one, but that doesn't work well in high density areas. We have an idea to get around that by making a much more mobile track, but the R&D department (my wife) hasn't cracked in on it yet. But that's not anything like what I was expecting, I should have looked at the Pinewood derby link. That looks cool. if the aluminum or wooden tracks are not portable enough, have you thought about making the track out of the foam cores materials you're using for the cars? Even the pine wood used for the pinewood derby cars are too light. The weights the scouts use are there to make the wooden cars heavy enough to race. Otherwise the average car weights around 2-3 oz without the weights and wouldn't make it to the finish line. The cars have to overcome friction in the plastic wheels and the axles and friction between the wheels and the track if the wheels are not aligned properly and aren't driving straight. I think you would have a great market around here in St Pete, as in addition to the hipster/maker/millennial crowd, everyone has a fiberglass boat, and fiberglass work is largely a mystery to everyone. Anyway, I would be as interested in this as paint nite. Also, your workbench looks exactly like my garage.